When we lived in Belgium there was a strange type of bush that grew up high in the summertime at the front of our house. So we never bothered to find out what type of bush this was. Because we were renting the house the owner was responsible for the borders, shrubs and trees and all we had to do was cut the grass. Fred and I were sitting in the house on our own when I saw a butterfly go past the front window. Then just a few mins later I saw another one and then another and another. I remarked to Fred that I had seen four of them and thought that was unusual. Then when I saw another I walked over to the window to have a look to see if it was simply the same butterfly flying past different times or had we got a few hovering around. You can imagine my surprise when I saw not one, not 5 but loads of butterflies all the same type sitting on that strange bush. I called to Fred and we both opened the window and stepped out onto the balcony/veranda that stretched the length of the house. We were able to stand there and see the butterflies close up and we counted 34 butterflies on that bush at the same time. Fred went and got his camera and spent some time taking pictures of this awesome sight. We stood for about 30 mins watching the butterflies as they fed on this bush, parts of which were showing the effects already. We just stood and watched in amazement, not able to tear ourselves away from this beautiful sight. How did all those butterflies know to appear at our bush on that one same day? This was a day we will never forget, a unique day a quiet but awe inspiring day. 14 months later and we were in the throes of doing the inventory of our belongings in this house and organising to buy a house back in Northern Ireland. The time had come to leave Belgium. 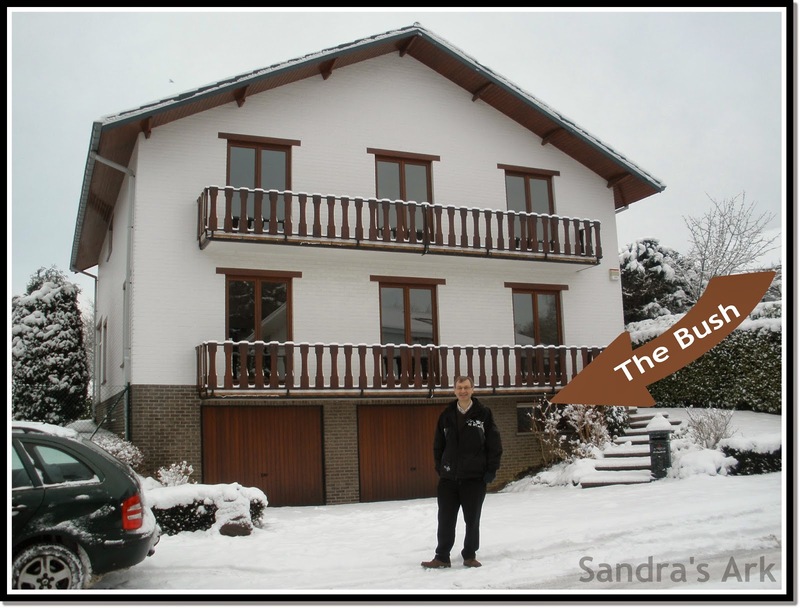 We had been back on a few different trips looking for a house and had fallen in love with one which had a lovely kitchen and Sun Room and nice bathrooms, almost the opposite to this one in Belgium. At different times I would say about what I would miss about the house in Belgium but there were a lot of things I wouldn't miss. One of the things I would miss was the fact that our house was in a lovely location enabling us to drive past the Tervuren Roundabout most days and that was a sight that put a smile on my face with it's beautiful fountain. Another thing I was going to miss was the butterfly bush as I continued to call it even though by this time I had looked it up on Google and found out it was really called a "Buddlea". I knew I was going to miss seeing the butterflies gathering there even though mostly we only saw a few at a time. I have always loved butterflies and like things that are decorated with butterflies. Along with all the friends we had made I knew that certain little things had made our 6 years in Belgium very happy and special to us and this simple bush was one of them. We moved to Northern Ireland also covered in snow and were very busy moving in the week leading up to Christmas. The New year passed by and quite a few months also as we continued to get settled in. We were going to miss the Butterflies! Then one day we realised that a bush in our new front garden which had been rather scrawny looking when we arrived was now growing up tall, then a while later it started to flower and you can image our surprise and delight to discover that we had a Butterfly Bush at our new home. 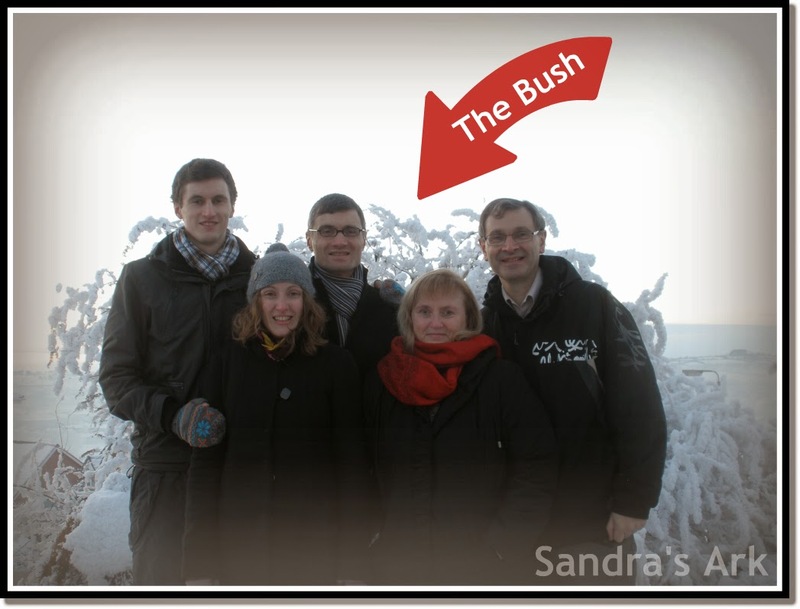 We had even taken a family picture in front of the bush a few days after moving in not realising what it was. Now we have never had 34 butterflies on this bush in Northern Ireland but in the past few summers we have regularly seen 5 or 6 at a time. Maybe someday they will all come but because of our open location at the top of a hill we may never get a mass of butterflies like we did that day in Tervuren. So thank you God that I don't have to say "I miss the butterflies". 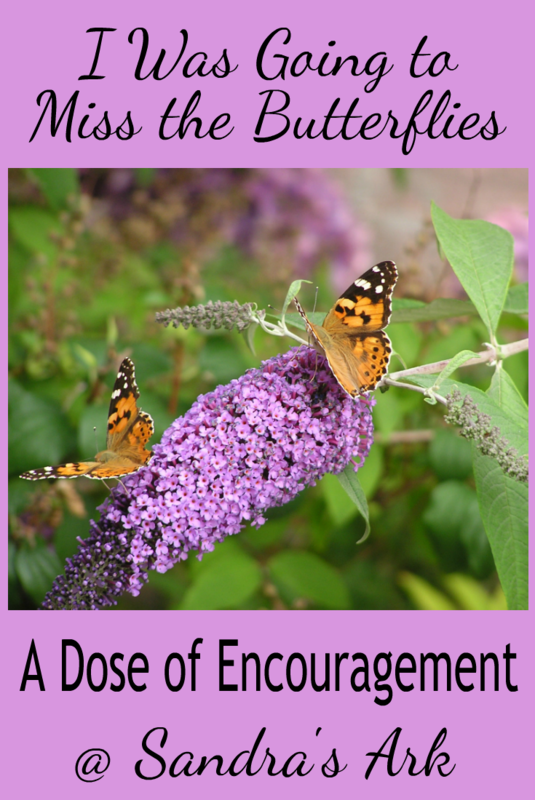 Who can say that God doesn't care about how we feel when we see that he gave us another Butterfly bush in our new home! My mother has one of those bushes and it sure does attract butterflies. It is really beautiful, too, with the purple flowers. God is so faithful to respond to the things we don't even know that we need. Actually the nick name for the Buddleia is Butterfly Bush. I love them and have a dwarf version in my butterfly garden here in the US. There is a dark red version I really love but just don't have the room for the larger versions of these bushes. Every time I see a butterfly in my garden, that is my moment with God. What a wonderful creature he has created. I always refer to it at home as the butterfly bush & I think that is much nicer name for it. Isn't God so creative. thanks for dropping by. Thank you for sharing your butterfly story with us here at "Tell Me a Story." 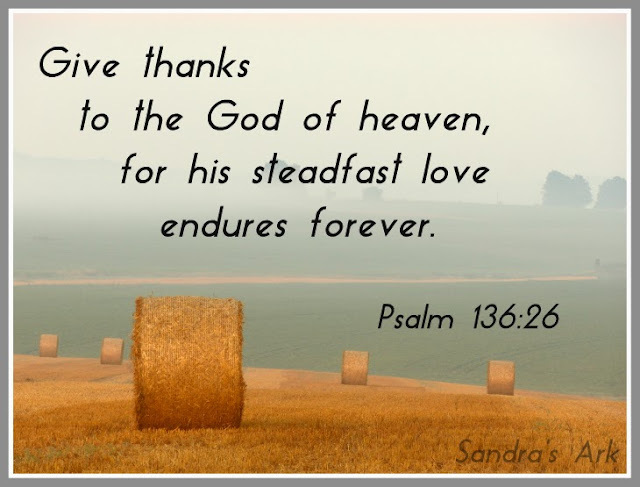 http://letmetelluastory.blogspot.com/ It those little pleasures that God delights to give us at times. My lemon tree is in bloom and bees are buzzing around it, and also some dark colored butterflies. I was surprised to see the butterflies. That's God! How wonderful the ways He shows Himself to us so personally. He is in all the details of our lives. Yes Laura, so glad He cares about the details. All I can say is that I am a butterfly addict. Love them SO MUCH!!! Look forward to this time of year to turn warmer so they will be around and about again. Thank you. That is so cool how God provided one of the things that you missed!!! Love it! Jennifer I am so sorry I was sure I had replied ages ago when I read this comment but don't know what happened. Thank you for dropping in to read my blog. This is a beautiful story! I love when God blesses us with these things that we hold deep in our heart! Elizabeth I am so sorry I was sure I had replied ages ago when I read this comment but don't know what happened. Thanks for dropping in from the link up I enjoy it each week. Beautiful pictures! What a blessing! Ellen I am so sorry I was sure I had replied ages ago when I read this comment but don't know what happened. Those pictures always bring a smile to my face, I enjoy them and they bring back memories of Belgium. I loved the butterfly story, so touching and sincere! Passing by from the Tuesday with a Twist Link up! Marwa I am so sorry I was sure I had replied ages ago when I read this comment but don't know what happened. It is nice to meet you, I just added you to my circles and thank you for the words of encouragement. I love butterflies, and love your post, it is so nice to take a break from life to observe the Creator's creations. Thanks for sharing on Tuesdays With a Twist, featuring your post today. I LOVE butterflies. What a beautiful story. Thank you for sharing at The Weekend Brew! The butterfly bush was a tender mercy for sure. PS. We don't see enough butterflies any more. Maybe I need one of those bushes! Hello Sue nice to meet you, yes you need a bush the, butterflies are always amazing. thanks for dropping in. That is a good idea Sarah, I should find out about other bushes too. Thanks for dropping in. Hi Laurie thanks for dropping in, nice to meet you. Good to visit you here. Thanks for this share and enjoy a beautiful weekend. Good scripture too. I used to grow those in Ohio! They were magical! I've not found a way for them to survive the heat here in the desert of Arizona, though. It is both beautiful and inspirational! Perhaps we can meet when we visit our children and grandchildren in Dublin. We're hoping for August if health allows! Jenny Matlock it is lovely to meet you. If I am not travelling during your visit to Dublin I would love to meet you. Our wedding anniversary is in Aug so we always try to get away for a bit of a trip sometime that month. Let me know, meeting a fellow blogger would be great as we are few and far between here in Northern Ireland (as the saying goes). What lovely memories to have. Made me think of my mum as we used to have one at home when i was little !